Ascending Butterfly: It's our Blog-A-Versary but YOU get the Cake! - Win Chocolate Truffle Lava Cakes from Bake-Me-A-Wish! It's our Blog-A-Versary but YOU get the Cake! 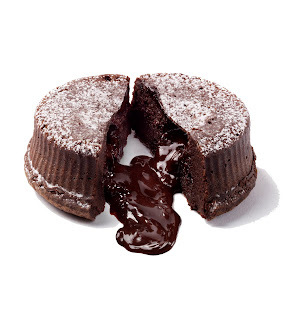 - Win Chocolate Truffle Lava Cakes from Bake-Me-A-Wish! June 14th made Ascending Butterfly's 'Blog-A-Versary', our official one year birthday! I don't know about you, but the best way to celebrate a birthday is with CAKE. And if it's chocolate cake even better. And if there are truffles involved it's just as close to perfection as you can get in my book! Last month, Eli's Cheesecake made our Mother's Day Buying Guide special, and this month Bake-Me-A-Wish is taking over to make our 'Blog-A-Versary' one to remember! I had the opportunity to try their Chocolate Truffle Lava Cakes, they arrive in packs of 4, and are meant to be eaten warmed, you can pop them into the microwave. "After heating, each cake is a single-serve masterpiece with warm, thick chocolate cake, powdered sugar and a surprise inside - rich, liquid chocolate flows out of the middle for a taste experience beyond compare." I have to tell you this is no ordinary chocolate cake. This is an experience. You are going to want to hide these and have all four for yourself. But if you can somehow manage to part with one, the person you share these with will love you forever! (OK, I can't guarantee that, but I sure know they won't forget you!). You all know how much I love companies that give back, and even in my snacking, I want to find a way to make a difference. And these cakes tasted so much sweeter when I found out about 'Operation Birthday Cake'. Bake-Me-A-Wish! in conjunction with their partner Soldiers’ Angels donate 5% of your order to assist in their efforts in sending birthday cakes each month to soldiers overseas. This is very near and dear to me as I have family and dear friends who serve in our military, knowing that there is a company out there that cares enough to want our soldiers to understand just how much their efforts and sacrifice is appreciated by all of us back home, and that they won't miss out on having a 'real birthday' celebration while they are in active duty is something near and dear to my heart! If you have a soldier's birthday approaching, click here to send a cake to an APO/FPO address. So far, they have been responsible for the delivery of over 6,000 cakes in the past few years! Recently, Bake-Me-A-Wish helped to celebrate CPT Dan Murphy's 40th birthday, by sending 40 cakes for his 40th to Kosovo, you can see images from the birthday party celebration here. Do you want to help them to do something cool this 4th of July? If the Bake-Me-A-Wish Facebook page reaches 4,000 fans by July 4th, they will donate 50 additional cakes then they did last month. That's 50 soldiers, 50 parties and a lot of really great moral! If you have a special soldier in your life, please Like Bake-Me-A-Wish on Facebook and encourage your friends to do the same! Ƹ̵̡Ӝ̵̨̄Ʒ - WIN IT! - Ascending Butterfly and our friends at Bake-Me-A-Wish! would like to provide 1 Ascending Butterfly Follower with Chocolate Truffle Lava Cakes! Don't you just ♥ Bake-Me-A-Wish!? I know I do! Ƹ̵̡Ӝ̵̨̄Ʒ - How to Win: (1) You must be a PUBLIC follower of Ascending Butterfly to be eligible for this and all giveaways. Indicate in your entry that you follow (if your 'comment name/user id' differs from your profile id, please let me know what name you follow under) and (2) Visit Bake-Me-A-Wish! and pick another cake that tickles your fancy and leave the LINK to that cake in your comment entry! (3) You must also leave your email address somewhere in your comment. (You can format it this way for security, example: ascendingbutterfly AT mail host DOT com). (If your email is clearly visible in your profile, you can just say so, that's OK!) Please follow the easy 1, 2, 3 steps to winning This giveaway is open to USA residents who are 18 years of age or older. PS Thanks for alerting me about the missing mandatory entry, I thought that went through earlier this AM. Sorry about the poorly timed entries. I voted for you on Bloggers Choice Awards! Tracy this is the best thing for a company to do. This brought tears to my eyes. I am a gfc follower. I think this looks really good. Thanks so much for this yummy giveaway. I'm a public follower and my email is in my profile. my email is visible, thanks. I subscribed to receive emails. I follow and I'd love to try the Mississippi Mud Cake! I like the Triple Chocolate Enrobed Brownie Cake. I would like to try the Peanut Butter Mousse cake. I follow you publicly on blogger. Follower and this cake makes looks so good.. I follow BakeMeAWish on Twitter @amandapersists - Thanks again!! and I like Ascending Butterfly on Facebook (Amanda Davis) Thanks again!! I also follow Tracy_Iglesias on Twitter @amandapersists - Thanks again! I subscribe to your rss feeds. http://www.bakemeawish.com/cakes-carrot_cake-22.php?occasion_id=5 is the link to Carrot Cake my favorite dessert. I follow you on google friends connect now. directorylanesuperstoreATgmail.com Barb g. This is the main entry. Public follower...I would love to try the Coconut Cream Cake. I'm a public follower on GFC. I follow bake me a wish on Twitter @lprice79. I follow your blog publicly with google friend connect as Theresa. The Mississippi Mud Cake sounds delicious. I Like Bake Me A Wish on facebook and wrote on the wall that Ascending Butterfly sent me. I Like Ascending Butterfly on Facebook. I already Subscribe to receive Ascending Butterfly emails. I like the Vanilla Bean. I follow on GFC! Also the Coconut Cream cake sounds delicious! I follow as Aisling and my email address is in my profile. The Raspberry Viennese Coffee Cake at http://www.bakemeawish.com/cakes-viennese_coffee_cake__raspberry_flavor-43.php?occasion_id=1 would be a wonderful way to start off any day. The peanut butter mousse cake looks divine. Follower, I would love to get the http://www.bakemeawish.com/cakes-magic_bar_brownie_cake-49.php?occasion_id=1 Thanks! Let me get dirty...yum...Mississippis mud cake. I follow and would like to try the Magic Bar Brownie Cake. I'd love to try the Tiramisu Classico Cake. FB fan of Bake Me A Wish & left message on wall. 'Slip Into Summer' - Win a Mrs. Smith Bag! Today's Words of Inspiration - Relaxing Mondays!